Disposable gloves and aprons are a vital aspect of healthcare, so it's important that they can be stored in a way that makes access easy for quicker response to emergencies. The Confidence Wall-Mounted Glove and Apron Dispenser makes gloves and aprons easy to store and easy to access in medical and laboratory environments, making proper infection control and hygiene maintenance easy. In medical environments, speed is a vital aspect of patient care, so it's important that supplies can be accessed easily and quickly. The glove and apron dispenser does exactly that, placing disposable gloves and aprons in an easy-to-access location. This not only helps improve speed of equipment access in an emergency, but also helps to keep medical environments tidy. 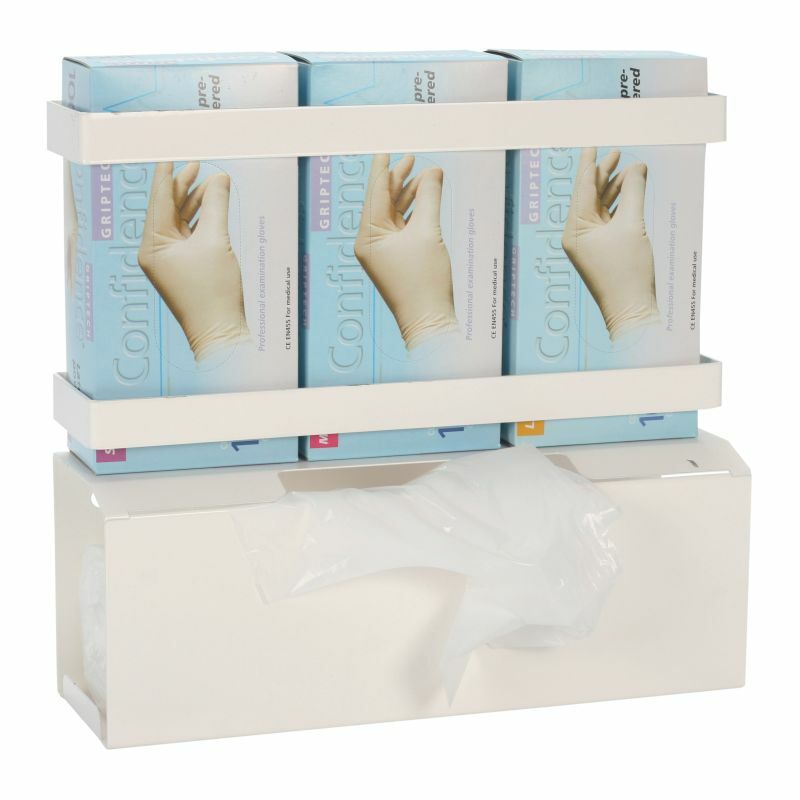 To ensure that users of all needs can easily access disposable gloves, the dispenser has been designed to hold three boxes of disposable gloves. This is ideal for providing different gloves and different sized gloves to match the needs of different medical practitioners. It enables powdered, powder-free and latex-free examination gloves to be stored in a single location. This helps in streamlining care and makes it easier for you keep your facility organised. Helping you ensure that hygiene standards are maintained, the glove and apron dispenser features a white antimicrobial coating. This makes the surface of the dispenser inhospitable to bacteria, and also makes it easier to clean. 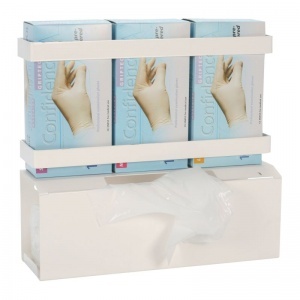 While other disposable gloves and aprons may also be compatible with the dispenser, it would be the responsibility of the purchaser to determine this. Please note that the pictured gloves and aprons are not included.